San Diego Padres GM Byrnes made a huge, and to the low budget Padres very expensive, mistake in trading for Carlos Quentin. The prospects he sent to the White Sox notwithstanding, Quentin had averaged only 98 games per season in the field for the White Sox over the past three seasons. Nothing indicated he would be any more healthy his year. In fact, the pattern of being injury prone was in place like a Huge Red Flag and Byrnes simply ignored the warning signs. Byrnes wanted to make up for another huge mistake he made while in Arizona in trading away a then 24 year old Quentin and in doing so compounded his mistake. Now Quentin has injured his right leg and will undergo arthroscopic surgery on Monday. Quentin is expected to miss 4-6 weeks and at the very minimum, the first 2 weeks of the regular season. 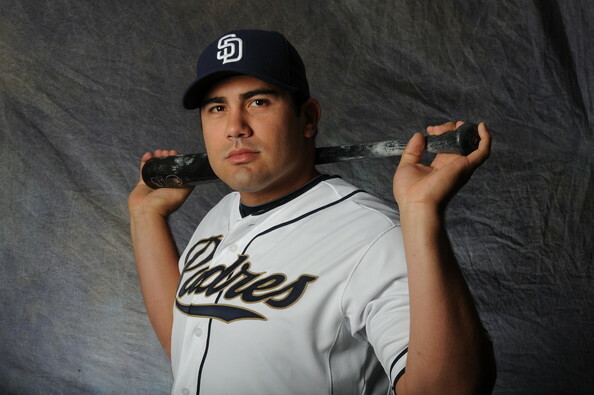 More likely he will return to the Padres lineup in the last week of April or early May. To add insult to Quentin’s injury, it is to his right leg, the drive leg for a right handed hitter, and will rob him of power all season. Power is the only thing Quentin has to offer to the Padres as he has been the very worst defensive outfielder in major league baseball over the past 3 seasons with a -38.2 UZR. Those of you who follow me know that I am not a big fan of defensive metrics like UZR unless there is at least 3 years of data to analyze. Looking at just one season of data is totally useless. Well we have three years of Quentin’s defensive contributions to base a good determination of his ability in the field on and it says what our eyes have been telling us, he is horrendous with the glove. So the bottom line of Byrnes screw up is that Quentin will give the Padres under 100 games of mediocre power and atrocious defense and then Quentin will leave in free agency after the season. The GM of the team can afford to make mistakes like this when you have a $100+ million payroll, but in San Diego it can be fatal to your hopes of a decent season. Byrnes hubris in trying to redeem himself for an earlier mistake and Quentin’s continuing injury problems may have torpedoed San Diego chances at a .500 season before the season even begins. I’ve had my say about Byrnes, Quentin and the San Diego Padres. Now its your turn. What do you think? Do you blame him for going out and adding a bat like Quentin? Sure he's flawed, wasn't a crazy high-caliber acquisition (hence not dealing any top 10 prospects for him), but one thing that stood out to me in looking at Quentin's stats is no big leaguer hit for a higher ISO while striking out as infrequently as Quentin did. Considering the Padres were 1st (or maybe the Nats passed them during the last week) in strikeouts and last in homerun's, Quentin's addition was understandable (to me). Taking all that in, I can understand why Byrnes would give up what he did for a very good chance of upgrading the position a ton. That said, I don't think Blanks, Guzman and Darnell were given enough consideration to do the same, as in they should have seen a nice improvement simply by going with the guys they had available. Yes I do blame him. Quentin has started 98 games on average the past 3 seasons and only finished 231. An average of 77 per season. In the games he has played in the field he has less than 950 AB over the past 3 seasons. ISO only matters if you actually play everyday. Quentin hit .245/.336/.479 over that period in a HITTERS park and division. He wont hit that in Petco and the NL West. Think under .230. Sound familiar for Padres LF? Chris Denorfia hit .274/.336/.406 as a Padre while playing league best dWAR over the past two seasons. This season Denorfia will make $1.17 million. Quentin, $7 million. I will take Denorfia with Guzman and Blanks every single time. Especially since two good pitching prospects, who will likely compete at the ML level at some point this season for the White Sox, would still be part of an already incredibly strong Padres farm system. Yes I DO blame Byrnes for this one. He was looking in the past instead of into the future.